This week has been my first at a new teaching job. It's been a true breath of fresh air and an inspiration in every sense of the word. Side note: need some inspiration? Check out children inspire design and the shine project. Ok, back to my story... I had been VERY nervous about basically "jumping ship" with a major life decision this past spring when I, indeed, jumped ship. Change scares the bejesus out of me sometimes and I felt like I had finally lost it this July when it hit me that I was leaving a job I love, with coworkers I adore, and students who made me realize that I had indeed chosen a vocation (ps- its genetic! My grandma and aunts are teachers, thanks a lot, guys!) and not just a job. But, there's this little face I needed to see more of...so, I did it. Love will make you do the darnedest things! I switched a hellish commute for a short one so that I could snuggle a bit more and spend non-commuting time with my favorite pigtail-wearing giggle-monster. I traded the Babysitter literally sent down from heaven (contact me if you need someone near DC because this woman is truly amazing...) for a (gasp!) stranger. It was one of the hardest decisions I've had to make, but...it's feeling good. So, I leave you with this little story and no results. But maybe someone else out there who's about to splash into the water after jumping will feel a bit of solidarity. Posters all courtesy of Pinterest. Look me up...I'm Megan Elizabeth! Over coffee this morning, my friend (Mamicomio's writer) and I discussed how our kids will probably turn out ok as long as we love them and give them the basics (structure, decent role models, etc.). Too often, parents are anxious and paranoid about how their children will turn out, worrying that they are not providing enough of everything to make them "happy". In my short little time as a mom and my relatively longer time as a teacher, I have begun to think that kids will inevitably become something great, as long as they are loved, disciplined and given experiences (both positive and negative) to learn from. We fall into what I am now labeling the "spectrum of goodness". As parents, we don't have to try and "make" our kids into something. We just guide them gently, teach them valuable life lessons like respect for others and themselves and add a dash of "hope for the best". After a crazy day, sometimes looking at something that is truly beautiful can help to calm the nerves. How true are these words? His quote goes nicely with my newest Pinterest board (feel free to follow) called lovely.simple. When I look at my sweet little girl some evenings, I daydream of the lessons that I want her to learn and the quotes that we will say to her to remind her of the important things in life. I'm working on narrowing it down and might hang our "mantra" in the kitchen somewhere as a constant reminder for our little family. Check out the new paintings for sale. About once a week I get to see a great sunrise and thought you might enjoy these fiery and amazing sun bursts. Happy weekend. Ketzali Scarf, please! Baggu, organize my life! I need these in my mom bag to keep a little order. Done! Delicious and beautiful new blog to follow! uh oh deliciousness. The First Mess has beautiful food photography and warm, delicious recipes. Happy weekend and expect some new and exciting paintings on Monday! "Blue Squares" and "Cielo" have arrived! Check them out on ETSY. Enjoy! Three more paintings coming your way tonight. Crazy? Yes. Happy "Monday". Paintings are chugging along after a brief Valentine's break. Here are 3 new ones! All so random, how does that happen? I just love this crazy little hobby/obsession/gig. Painting #8 took me out of my "cheerful / bright" comfort zone and it was so fun! Who knew there were so many different shades of gray to be mixed. It's called "shadow" and will be posted on etsy soon. Two images are attached for this one because the shades change pretty drastically in the light / shadows. A little ocean inspiration...thanks pinterest for keeping me interested. Painting #7 (29 for 29)! Painting #7 is here! "Daffodil" is springy and beautiful and makes me want to run through a field of wild flowers! Look! A treasury list on Etsy! I love Etsy. What a friendly little community of creative nerds like me. If only we could have all sat together at the same lunch table in school, imagine what we could have come up with! (sorry, thats the high school teacher in me talking, I digress). Today, I stumbled upon a great treasury list, (called "Beachy-Keen") featuring MY ART! Thank you Sophie. Now, quit reading my blog and GO BUY SOME (of my) ART! This weekend's paintings for the "29 for 29" are inspired by tropical travels. What better way to brighten up a winter day than with a beach-inspired painting! I love the color yellow and my scarf today reminded me of how much it can cheer up a dull winter day. Here are a couple of my favorite travel photos from Spain. Have a sunny day dreaming of a trip somewhere bright and yellow. I love this photo found on flikr today accidentally courtesy of Pinterest. (Do I do any work at work, you might ask? tee-hee) If I can find time to paint, this is the new inspiration. 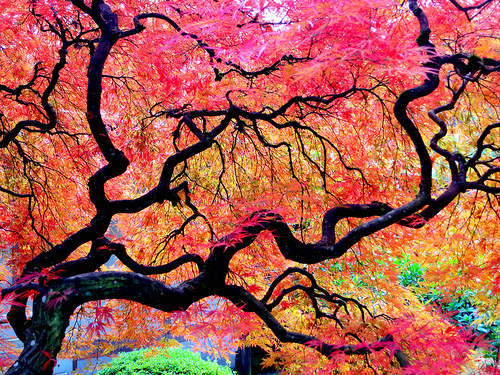 It was taken in the Japanese Gardens in Portland, Oregon. Looks a little like this! Ever since I watched the movie "Wimbledon" for the first time, I have loved the white double banded watch that Kirsten Dunst wears. However, it doesn't exist. I cannot find it anywhere!! It's official, I'm addicted to Pinterest - it's just so darn fun to browse while holding a sleeping baby :) I have found some great wall art / quotes that deserve mentioning. Enjoy!